Islands Apart, God Working Through Us. do. The morning of the 25th found Leah with a fever, vomiting, and other unpleasantries. Francis decided to go to Palawan, and Leah would stay, with the girls on staff at the clinic under strict orders to come and babysit her. The previous few weeks, we have been getting to know a beautiful woman named *Sarah, a woman in her 50's who is walking a hard road. A Week In Palawan Through Francis' Eyes. It was not easy to leave my beautiful wife who was too sick to travel. I could not keep myself from thinking of her as we were apart for more than a day for the first time in our marriage. I met the team from New Beginnings two years back when they came with Crossroads Christian Ministries. I was very encouraged to meet these Filipinos who came all the way from America to serve the least in the Philippines. After that first medical mission, the fruits of their labor were amazing, as souls truly came into the Kingdom and met God, and a new Church was started where they can grow. This most recent trip back to Coron, Palawan helped the local Body of Christ minister to the communities. 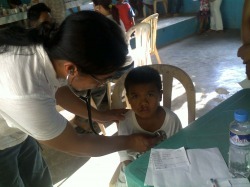 We saw and treated over 300 medical and dental patients a day, some walking from very far to get medical help. We were able to help bring healing to their bodies, and pray over them, pointing them to Jesus who can truly heal and make them whole. God was at work, and my heart was blessed to be used as a picture of compassion and love to these people. 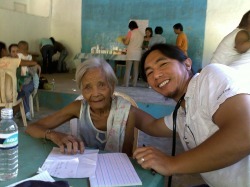 The amazing people I worked beside were truly a testimony of God's mercy and grace for the poor in Palawan. This journey with Jesus gets more interesting every day, and as I travel the road with Him, and delve deeper into His heart, I find myself asking Him as I am waking in the morning, "What is on your heart for today? Let me be a part of it. Oh please let me be a part of it." God was stirring in me, whispering to me just a glimpse of His heart for Sarah, and even that small glimpse filled my eyes with tears. I felt clearly in my spirit that God's plans were about loving this beautiful one and not about me going to Palawan. I waited excitedly to see what He would do. He never disappoints. When I looked at Sarah, I saw a women with her head hung low, her eyes downcast, her spirit heavy. She has come from a past full of hardship and loss, and I felt that she somehow believed that she deserved it. Our first day together I began to love her with all that was in me. I asked God to pour His love out of me, onto her, and cover her like a warm blanket. She began to share her heart in small pieces, little by little, trusting me with the deep places in her soul. I would hold her and we would pray, and tears began to fall. "You are so valuable," I told her, " God sees your heart as a treasure, He loves you with a passion no person could ever show you. He sees your pain, and holds every tear." "No one ever told me that I was valuable," she whispered. "Of course that is why I do not believe I am." She told me that last year Francis had given her a book and she while reading it, learned the way to come into relationship with Jesus. She had prayed and asked Him to come and save her, but she was feeling so unworthy, and did not know how to grow. "Sarah, God has written your name on His hand, He says that you are His bride, and if you are the bride of the King of the Universe, that makes you a queen. He has freedom, life, and a future for you that is filled with hope. There is no condemnation for you." She laid her head on my shoulder and wept, a flood of relief, new-found freedom, and still the pain of wounds that are not yet healed. That night I asked if I could serve her and rub her tired feet. As I massaged, I felt a lump on both feet where the pressure point for the thyroid is located. I asked her if there was a problem with her thyroid. "Yes!," she said, pulling the hair away from her neck she tilted her head back. I could see a small mass where her thyroid was enlarged, but she went on to tell me, "For many years now, I choke on my food and cannot swallow, and often I cannot breathe very well." I realized that her goiter (enlarging thyroid) was growing inward instead of outward, and cutting off her airway as well as blocking her esophagus. I asked if I could pray healing over her, because our God is her healer. I touched her thyroid and asked God to show her His power and love by healing her. The next morning she greeted me with a smile. Hugging me she said, "When you prayed last night, I suddenly can breathe well, and today I feel this lump getting smaller." Her eyes sparkled with life, and with the realization that her God cares for her, and will take care of her every need. Today I look at Sarah and I see a radiant woman whose heart is healing, whose head is held high with confidence, whose smile is wide, eyes sparkling with joy. I revel as I watch her, seeing with fresh eyes that the hope that God gives us makes us soar with new wings. He means it when He says He has a future and hope for us, plans to prosper us. Sometimes it takes brokenness for us to realize His undying love and out of that brokenness comes beauty that we could not imagine.